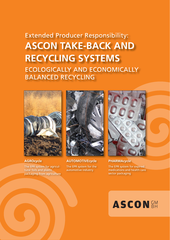 ...is President of ASCON Resource Management Corporation. Mr. Schuh is a circular economy and EPR (Extended Producer Responsibility) executive with a strong international profile who has expert knowledge on recycling, with a particular expertise in plastic recycling. Mr. Schuh is the founder and owner of Germany based ASCON Holding, a leading European circular economy company with several subsidiaries. He has a deep level of conviction and passion for the circular economy and has a history of success in driving recycling innovation, discovering new recycling markets and implementing EPR. ...acts as Vice President of ASCON Corp. She is one of the CEOs of ASCON Resource Management Holding GmbH and ASCON GmbH, heading the HR and finance departments of the group of companies. ...is the Head of Communication & Marketing of ASCON Resource Management Holding and all of its subsidiaries. Ms. Emons is a communications expert who has worked on the development and expansion of dual packaging recycling systems since the nineties, during which time she acquired extensive knowledge of the recycling industry. Ms. Emons is the former Head of Communication and General Secretary of PRO EUROPE, the European umbrella organization of green dot systems, with a passion for EPR, the circular economy, packaging licensing and recycling.